Any IT manager looking at the cloud can cite some analytical report that trumpets the virtues of the cloud. Let’s use the MarketsandMarkets Cloud Backup Market report that shows the cloud backup market was USD 1.30 Billion in 2017 or how about the IDG 2018 Cloud Computing Executive Summary, that states 73% of all organizations have at least one app in the cloud. It appears safe to use the prevailing premise that cloud services save businesses money. However, some IT departments end up reporting soaring costs after switching away from on-premises backup storage to a cloud model. How is this possible? What should customers look out for beyond standard entry pricing? — Egad, egress cloud charges! What is Cloud Data Egress? Cloud data egress describes the movement of data originating within a cloud network and transferring to another geography, external cloud, or back to an on-premises environment. Data egress is a regular part of cloud backup activity and essential to everyday business. So, you think you’ve done everything right in your move to the cloud. WAN connection speeds, check. Automated data movement from your network, check. Great money savings on CAPEX and OPEX. Check. Physical and digital security. Check. Even after extensive due diligence on migrating to the cloud, IT admins are admitting that up to 35% of their cloud spend is wasted — according to the RightScale 2018 State of the Cloud Report. Identifying and optimizing cloud cost can now be a full-time job, especially considering the size, scope, and complexity of most cloud bills. The primary reason for continued public cloud waste is the unnerving complexity of cloud pricing and billing. Most megacloud pricing models routinely cause so much cloud billing confusion that even mature cloud admins will likely need a Turing machine to decipher the bill. Understanding cost-effective options for running most workload scenarios is a management challenge that organizations are often unable and unprepared to address. Let’s say a scenario like a litigation eDiscovery request comes through, and you need to download multiple terabytes of data from cloud storage, every month for the next three months. You are about to learn the real world pricing of data egress, and it will rock your world. So the promise of low costs drives the initial decision to move to the cloud. Ingress is usually free, and customers understand that they are buying the usage of a cloud providers’ infrastructure plus its data storage capabilities, data protection, and management functions. What is commonly overlooked are transactional fees and even more significant, egress fees. Yes, there is a fee to download and take your data back home. The megacloud (hyperscaler cloud vendors) are primarily tuned for cold storage, meaning they are intended for storing data that does not need to be swiftly nor frequently accessed. We can call this set-it-and-forget-it storage. 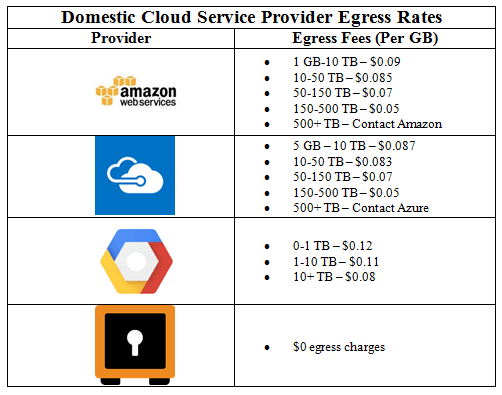 These network egress charges vary by cloud service provider (CSP) and depend on the amount of data moved in a month and the geography where the data resides. These fees tend to range between 5 and 23 cents per GB. Moving to a different cloud. Whether customers are switching from one provider to another or adopting a multi-cloud strategy, egress charges ratchet up fast when moving multi-TBs of data. There are also charges for cross-regional transfers where data is moved to another defined geography within a CSP’s cloud. In worst-case scenarios, data migration takes a lot of money and time. eDiscovery requests. Attorneys spread wide nets for eDiscovery searches. When the data resides in the cloud, IT must search for and egress large volumes of data by custodian, date range, and content. This process can egress hundreds or thousands of pages resulting in increased costs. Active archiving. Moving active archives from tape to the cloud sounds good in theory. However, if end-users are consistently egressing active archiving data or asking IT to do it, egress charges are going to increase costs. The usual megacloud suspects all charge similar egress fees based on capacity. For example, AWS charges from .09 cents per GB for 10 TB of data. Their lowest advertised cost is .05 cents per GB for egressing between 150 and 500 TB. For capacities above 500 TB, they would prefer to provide their egad egress pricing over the phone. Microsoft Azure and Google Cloud Platform are similarly priced. A quick tallied example would look like the following for a 30TB domestic transfer. This would cost between $2400 and $2550 with any of these three megaclouds. International charges are higher by about a third to a half. This cost could be absorbed if it only happens occasionally. However, when customers egress 30TB of data from their cloud provider on a monthly basis, by the end of the year, they’ve spent at least $30K — to simply access their own data. A $30K transactional fee will cause a real dent in any IT budget and has zero return on investment. Egress fees aren’t likely the only issue if you really want to go with a specific cloud vendor or if your corporation only does business with a single provider (aka vendor lock-in). But if you have a choice, know the right questions to ask about paying egress charges. What are your policies for moving aging data? 30 days is a common yardstick for separating active data from inactive. The older your data, the less likely you will need to retrieve it – if it is not subject to eDiscovery requests or active archiving. How often do you fulfill eDiscovery requests? A few emails here and there is one thing. But when you store aging email online – especially emails — a large eDiscovery request will generate high retrieval costs over long periods of time. How flexible are you with moving data to another provider, geography, or adopting multi-cloud strategies? More companies are looking at multi-cloud options, where they spread applications and data across several different cloud providers. However, egress charges could be high. Let’s say you store 500TB of data with a single provider and plan to move it all to multiple providers. Even at a volume discount of .05 cents per GB, you’ll spend $25K just for the privilege of moving your own data. Since cloud backup costs can vary significantly amongst cloud providers, it is critical that you analyze the factors that go into determining how they are calculated and decide if egress charges are worth it. It’s now evident that both cloud TCO and egress fees must be examined when evaluating CSPs. For the cloud to indeed achieve its promise of data protection and cost savings, customers must have billing predictability without the fear of being charged to get their data back. You shouldn’t have to pay extra to recover. Choosing a CSP that offers transparent, predictable pricing and has abandoned egress fees makes for a better cloud for everyone. As a customer, you need an egress-free cloud provider to secure backup data and keep it safe.